Drugs are typically analyzed by LC-MS. When active pharmaceutical ingredients (API) are analyzed for the presence of impurities, the general requirements are that every impurity found should be at concentration below 0.1% of the API or it must be either cleaned or identified and toxicologically characterized which is a time consuming and expensive procedure. However, the ionization yields of Electrospray and/or APCI in LC-MS are highly non-uniform and compound dependent, and as a result when an impurity is found in a given LC-MS mass chromatogram its actual concentration is not known. Consequently, regardless of its actual concentration that can be well below 0.1% every impurity that is found must be isolated, fully identified, synthesized (or obtained) and serve for the provision of a calibration curve in order to measure the actual concentration of that small impurity peak. In addition, several types of impurities such as non-polar compounds are not properly ionized and are not detected by LC-MS. Thus, clearly drug impurity analysis represents an unmet analytical challenge. Alternatively, GC-MS with its standard electron ionization (EI) can be used and has, for volatile compounds, approximately uniform, semi-quantitative ionization yield. However, GC-MS with standard EI is compatible only with a limited range of thermally stable drugs and it provides useful molecular ions only for a portion of the analyzed compounds. Furthermore, ion source degradation and peak tailing severely erode the standard EI response uniformity for semi-volatile compounds. We used the Aviv Analytical 5975-SMB GC-MS with Cold EI for the analysis of drug impurities. Cold EI is the electron ionization of cold molecules in supersonic molecular beams (SMB). The technology of GC-MS with Cold EI is reviewed by A. Amirav, A. Gordin, M. Poliak, and A. B. Fialkov, J. Mass Spectrom., 43, 141-163. (2008). The later is available upon request. GC-MS with Cold EI as implemented with the Aviv Analytical 5975-SMB uniquely extends the range of drugs that are amenable for GC-MS analysis, including thermally labile drugs that are not compatible with standard GC-MS analysis. Furthermore, it is characterized by having uniform response to all compounds due to its contact-free fly-through ion source that eliminates any ion source peak tailing or losses. In addition, it provides trustworthy enhanced molecular ions that can be converted with the Tal-Aviv Molecule Identifier software into elemental formulae. Thus, the high sensitivity and uniform response of Cold EI uniquely enables the detection, identification and quantitation of low level impurities in drugs without lengthy calibration procedures. In order to evaluated the above attributes of the 5975-SMB we analyzed impurities in two Active Pharmaceutical Ingredient (API) samples (powder form) of Haloperidol and Ramelteon (Structures are given below). Keep reading to find our how the Aviv Analytical 5975-SMB GC-MS with Cold EI uniquely enables quantitative drug impurities analysis and helps in their identification. Injector: 200ºC injector temperature with a Restek Skyline inert liner without glass wool. The elimination of glass wool and use of relatively low injector temperature are intended to suppress drugs degradation at the injector while the high injection flow rate enables effective sample transfer from the liner to the column despite the lower than usual injector temperature. Sample: Drug powders dissolved in methanol at about 500 ppm. He column flow rate: He at 16 ml/min for Haloperidol and 5 ml/min for Ramelteon. Injection volume: 1 µl in pulsed splitless mode (50 PSIG with 50 ml/min column flow rate during injection). GC Oven: For Haloperidol, 100ºC followed by 20ºC/min to 330ºC and hold for 3.5 min for a total of 15 min. For Ramelteon, 50ºC followed by 30C/min to 250ºC and 140ºC followed by 30ºC/min to 250ºC in SIM mode. SMB source: 12mA emission, 700 mBar nozzle backing pressure, 70 ml/min total He flow rate (column plus make up at 250ºC transfer line temperature). SMB transferline temperature: 250ºC with temperature program of 15ºC/min after 7 min to 320ºC. Recently, the Aviv Analytical 5975-SMB GC-MS with Cold EI was utilized for the analysis of several drugs, and in this post we discuss Haloperidol and Ramelteon as typical examples. 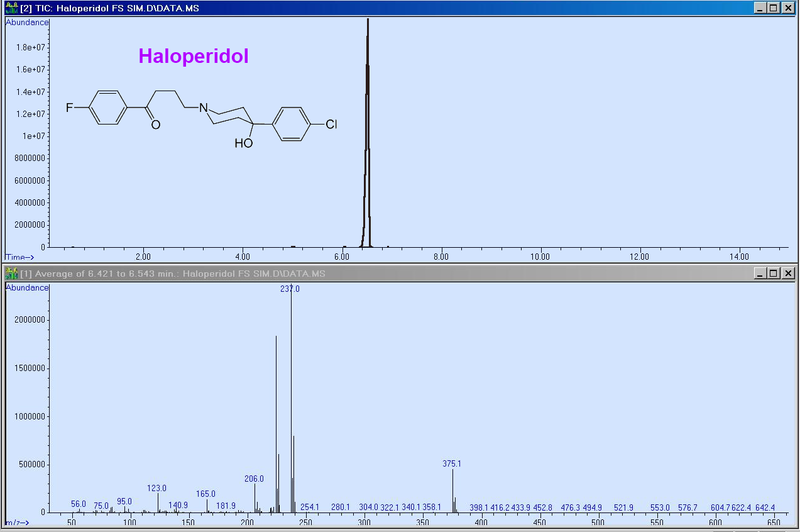 In Figure 1, the total ion count (TIC) mass chromatogram of Haloperidol (upper trace) and its Cold EI mass spectrum (bottom trace) are shown. 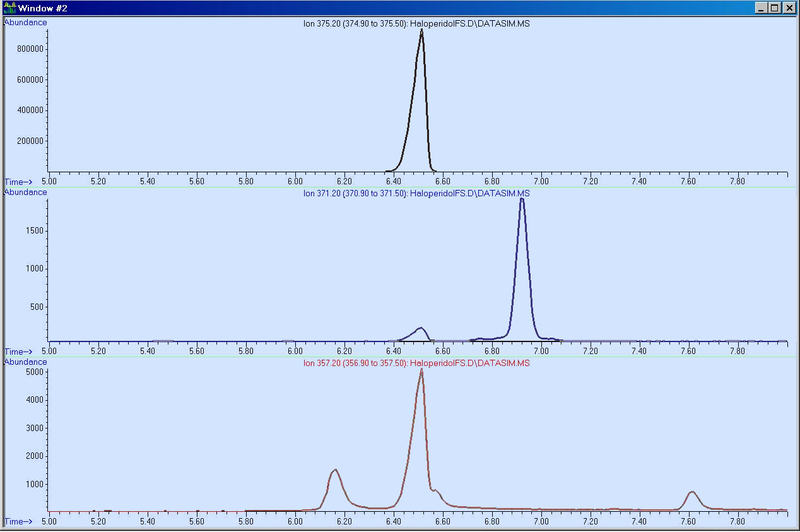 The mass chromatogram is clean with only one peak of Haloperidol. 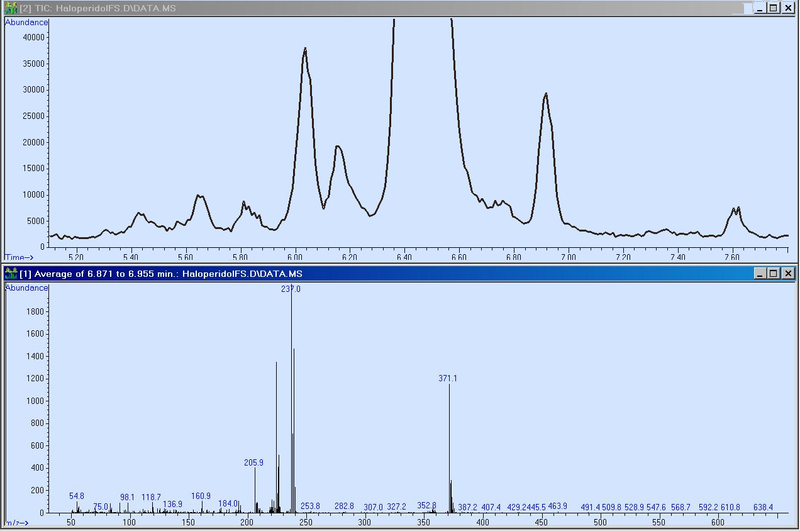 Since Haloperidol is a polar drug its chromatographic peak has some peak fronting at the level of 50 ng on-column amount. However, the use of 16 ml/min significantly increases the column capacity which relates to the film volume of a separation plate that is increased with the flow rate thereby minimizes this fronting. The Cold EI mass spectrum of Haloperidol is characterized by all the standard EI fragments plus largely enhanced molecular ion which is practically missing in standard EI. NIST library search identified Haloperidol with 95.6% probability and this identification was fully confirmed by the Tal-Aviv Molecule Identifier (TAMI) software with 995 (out of 1000) isotope abundance analysis matching factor. Figure 1. Full scan total ion count mass chromatogram (upper trace) and Cold EI mass spectrum of Haloperidol (bottom trace). The 5975-SMB GC-MS with Cold EI excels in its ability to elute drugs and their impurities without or with much less degradation (at the injector, column and ion source) than any other GC-MS. In addition, it provides trustworthy enhanced molecular ions, amplifies isomer MS effects, has no ion source peak tailing and it provides higher TIC sensitivity than standard GC-MS for polar drugs. Most important is the fact that unlike with LC-UV or LC-MS, GC-MS with Cold EI provides uniform, compound independent, semi quantitative response, without ion suppression effects. Thus, drug impurities analysis performed by a GC-MS with Cold EI may provide semi quantitative results about the concentration of drug isomers and impurities. Accordingly, if the TIC peak areas of the impurities are below 0.1% of the API peak area it can serve to claim that the drug is actually clean from that impurity, thereby saving the cost of impurity characterization and quantification and/or drug cleaning. In Figure 2 the zoomed-in total ion count (TIC) mass chromatogram of Haloperidol (upper trace) and the Cold EI mass spectrum of one of its impurities are shown. 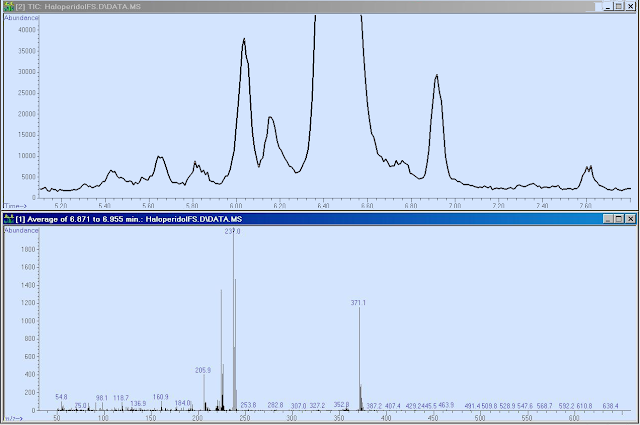 The TIC trace is actually the same as in Figure 1, magnified 500 times and considering the peak fronting of Haloperidol itself (due to onset of column saturation) the TIC full scale represents 0.12% amounts of any of its impurities. Several conclusions are made based on the observations shown in Figure 2: a) The Haloperidol API has a multitude of impurities; b) None of the impurities exceeds the level of 0.1%; c) The impurities elution times are centered near that of Haloperidol which hints to the fact that they are structurally related. The Cold EI MS of the major impurity with about 0.09% abundance shown at the bottom trace confirms this expectation, as the fragment mass spectral peaks are the same as of Haloperidol while the molecular ion is 4 amu lower with m/z=371. A reasonable assumption is that this impurity is likely to be Haloperidol without four hydrogen atoms. Figure 2. 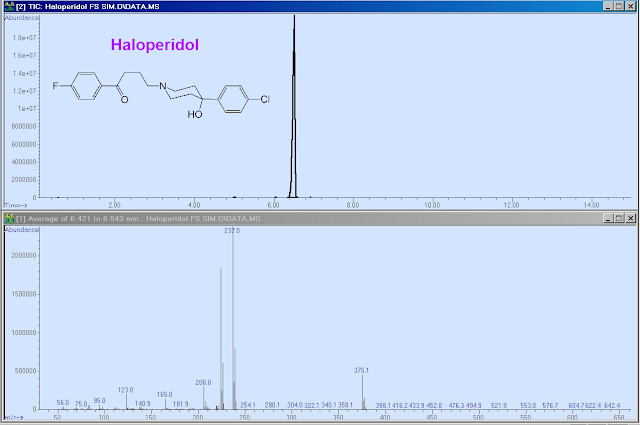 Zoomed full scan TIC trace of Haloperidol (Magnified TIC of Figure 1) with scale at about 0.12% (upper trace), and cold EI mass spectrum of the prominent impurity peak at about 6.9 min elution time (eluting after the Haloperidol peak). For the monitoring of Haloperidol API's cleaning procedure one can benefit from further improved sensitivity. Thus, we performed simultaneous full scan and SIM with SIM masses of the two major identified impurities (m/z=371 and 357) which were mostly homologous compounds that were likely structurally related to Haloperidol. The SIM traces are shown in figure 3 and as demonstrated, very good signal to noise ratio is obtained to enable accurate monitoring of the API cleaning efficiency of these impurities. Note that while we demonstrated the analysis of drug impurities that eluted near the drug API compound elution time, other impurities were also found particularly in the volatile organic compound (solvents) early elution time zone. However, these impurities have different methods for their analysis and cleaning of the API from them is relatively easy. We also found some trace amounts of ever present plasticizers such as dioctylphthalate but at this time we are unable to tell if this compound is from the API or our solvent and sample handling tools. In any case its amount is below 0.1%. Figure 3. SIM traces of three ions with M/Z = 375.2 (Haloperidol molecular ion, upper), M/Z= 371.2 (The impurity with mass spectrum of Figure 2 above) and M/Z=357.2 which is a minor ion of haloperidol but a major ion in three of its impurities as observed at the bottom trace (perhaps Haloperidol after water elimination). In order to further explore the usefulness of the 5975-SMB GC-MS with Cold EI for drug impurities analysis we studied the impurities of Ramelteon C16H21NO2. In Figure 4 below we show our findings in Ramelteon impurities analysis. 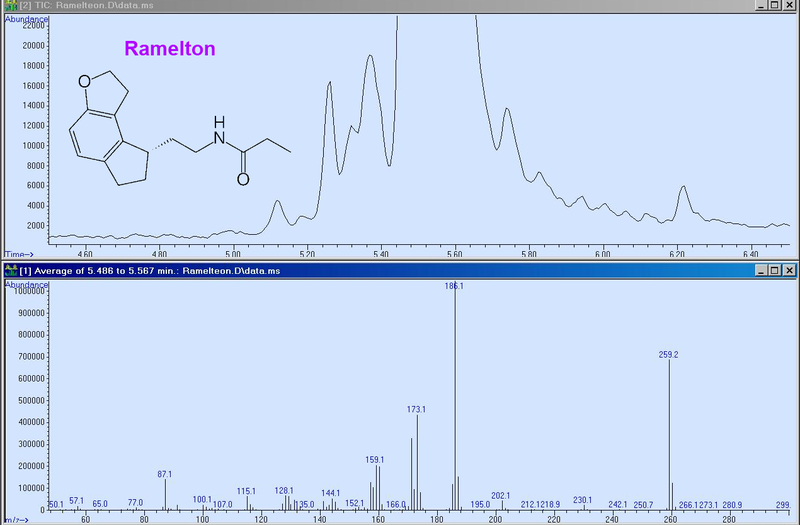 Not surprisingly the overall conclusion is that the results are similar to that of Haloperidol in: a) The Ramelteon API contains a multitude of impurities; b) None of the impurities exceeds the level of 0.1%; c) The impurities elution times are near that of Ramelteon which hints to the fact that they are structurally related (isomers and/or homologous compounds). Figure 4. 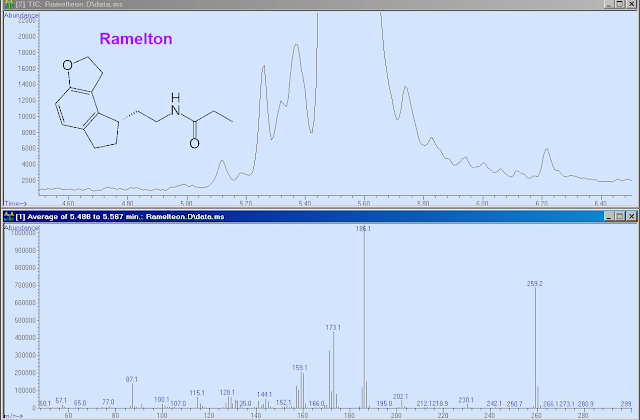 Full scan total ion count mass chromatogram of Ramelteon (upper trace) and its Cold EI mass spectrum (bottom trace) which shows a molecular ion at m/z=259.1 and elute at around 5.5 min. The Y axis of the chromatogram was magnified about 800 times so that, considering the small Ramelteon peak fronting, the Y scale is 0.1% of the API. Note the multitude of isomers and homologous compounds all of which gave informative mass spectra with distinct Cold EI molecular ions (not shown). 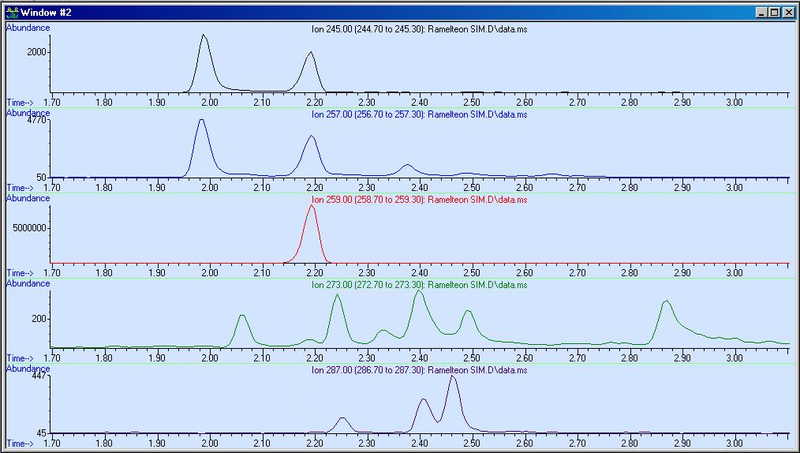 In Figure 5 we show five SIM traces of the Ramelteon API sample, obtained with higher initial GC oven temperature in order to facilitate faster analysis of four minutes. As demonstrated we found nine impurities and we further found three isomers from the zoom of m/z=259 trace. Finally, an important additional type of impurities is isomers. We note that in such trace isomer analysis, one must be careful in its performance since depending on the injector temperature some non-fully vaporized sample particles can migrate into the column (particularly when using a liner without glass wool as the one in the presented analysis) and appear as an isomer artifact. However, the 5975-SMB GC-MS with Cold EI enables such important analysis of isomers that were note remove by liquid chromatography but that are separated according to their volatility in the GC column and often provides clear isomer MS effects. The main goal of analyzing drugs impurities was achieved and demonstrated with the 5975-SMB GC-MS with Cold EI for Haloperidol and Ramelteon drugs. The uniform response of Cold EI with its fly-through ion source uniquely enables quantitation of the drug impurities levels without compound specific calibration curves. This capability is assumed to be 5975-SMB unique and we believe that such information cannot be obtained by any other type of GC-MS or LC-MS. Thus, the 5975-SMB GC-MS with Cold EI eliminates the need to identify and synthesize trace API impurities for their quantitation. Informative Cold EI mass spectra were obtained with a combination of enhanced molecular ions and fragment information plus some isomer mass spectral effects. Very good TIC signal to noise that approached 10+5 was obtained which enabled the detection of low levels (<0.1%) of impurities and isomers in the drugs with good signal to noise ratio. The achievement of such high TIC S/N emerged from a combination of high TIC S/N of the 5975-SMB plus increased column capacity for polar drugs with high column flow rates. Simultaneous full scan and SIM was used on suspected drug impurities masses (based on previous full scan analysis). This procedure was used in order to enable accurate monitoring, by having very high signal to noise ratios, of the efficiency of the impurities cleaning process. Ramelteon is not in the NIST library but our Tal-Aviv Molecule Identifier software based on isotope abundance analysis properly identified its elemental formula as number 1 thereby provided the value of high resolution accurate mass MS combined with molecular ions of SMB. The GC-MS with Cold EI analysis times were about three times faster than of standard GC-MS.